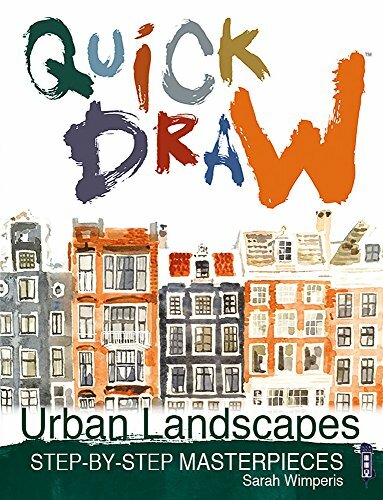 Quick Draw Urban Landscapes is a beginners guide to drawing urban landscapes. No prior knowledge of drawing is required, although having basic drawings skills would be beneficial. The book starts off by introducing the different drawing tools and materials you can use. The examples featured use all sorts of media, such as pencil, pens, dip pens, watercolour, pastels, oil and there's one example on drawing with your tablet. You can really just use any media you have unless you want to follow strictly. The lessons and examples are loose and lively rendition of urban landscapes and scenes. There are subjects like farmers market, rooftops, statues at a square, courtyard, streets, windows and shops. Some drawings are rough while others can be quite detailed. Overall, the examples and techniques aren't really technical so there's no pressure making yours look exactly the same. The step by step pictures show the process so you can get an idea on how to start and what to do next. The book uses photo references for practice however not all are provided. You can either just follow along with the step by step pictures, or just look for your own references online, or if you're daring enough, go outdoors and draw. The goal of the book perhaps is to introduce you to the different materials and styles you can achieve. You can check out more of Sarah Wimperis artworks on her blog. If you like sketching urban scenes or outdoors, check out other urban sketching books that I've reviewed.